Not the years 1700s-1800s, but the addresses. 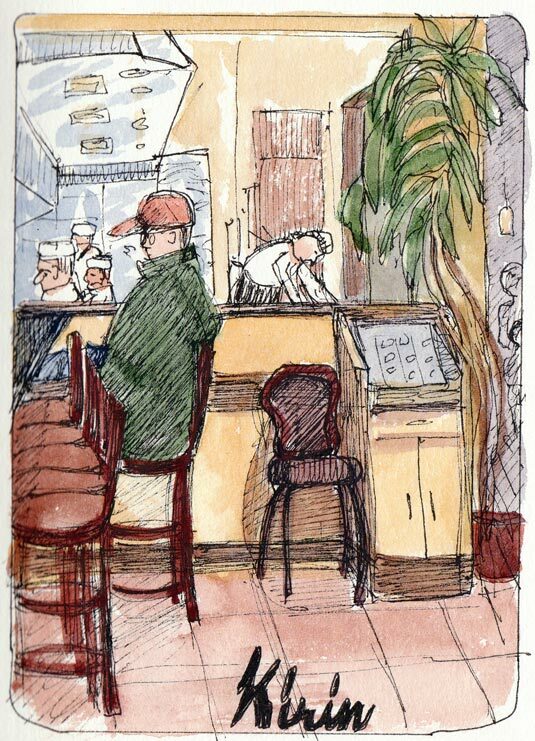 We started our Tuesday night sketchcrawl at La Farine Bakery (above), 1820 Solano Ave., Berkeley and two and half hours later we’d traveled only one block, ending at Kirin Restaurant, 1767 Solano Ave. Berkeley. It’s amazing how many interesting details there are to be seen and drawn on a street I’ve walked hundreds of times. 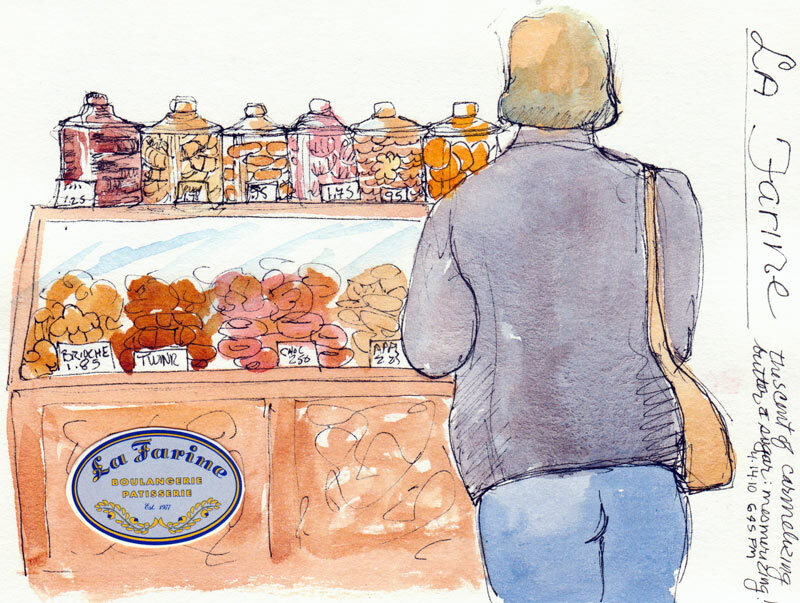 We only had 15 minutes to draw in the bakery since they were closing but the workday was just beginning for the baker who was tantalizing our noses with the mesmerizing scent of carmelizing sugar and butter. People rushed in and out, buying their bread for dinner. This lady (above) was in and out in less than two minutes. 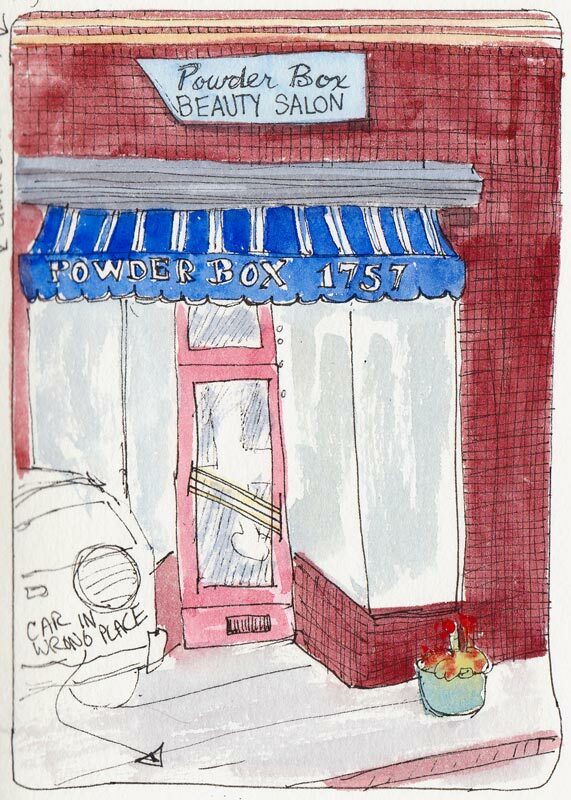 Then we headed outside and were captivated by the art deco signage on the Powder Box Beauty Salon which will probably be gone soon since they are moving around the corner. The wall is maroon tile and I spent way too much time drawing all the lines to indicate tile and then goofed when I drew the car parked in front of the building. I didn’t pay attention to how things lined up and accidentally parked the car on the sidewalk, halfway into the store. This shop reminds me of one we used to pass on the way to my grandmother’s house when I was a kid. I used to get so annoyed at that shop’s name: “Lipstick Beauty Salon,” because it didn’t make any sense, and that started my life-long pet peeve of dumb business names. 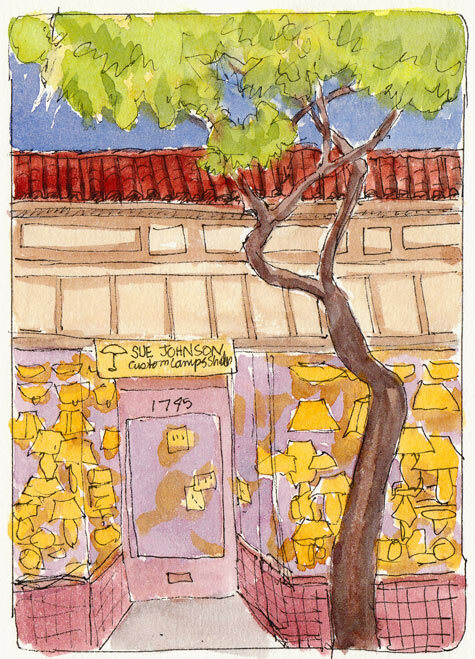 The sun had set and all the lit lamps at Sue Johnson’s shop were glowing in the windows. I’d never noticed the wonderful Spanish tiles and other decorative elements above the store windows, including a delicate mural of ivy leaves that I forgot to draw because I got so interested in the tree. We finished up at Kirin Restaurant when it got too cold outside. Cathy eats there regularly so felt comfortable asking the host if we could come in and sketch and he graciously agreed. (That’s my cartoony version of Cathy on a bar stool, still wearing her gigantic. arctic puffy down jacket and signature baseball cap.) The kitchen is visible behind glass walls. Jana, you can always make me laugh when I’m feeling grumpy! Thankyou. And for silly gibberish, you might get a laugh at my current post. Love this description of your sketching outing, and how sketching causes you to notice details you’d missed many times before in walking by. How lucky to have a sketch group! Great sketches. The car on the sidewalk is a funny spot and will probably perk up your memory more than anything else. I can’t believe how well you got that lady in the bakery in under two minutes! Jana, this really brings back memories. My older sister worked for the previous owner for many years (the late Barbara) and my other sister and I would often hang out in the parlor after school or on the occasional Saturday. The smells of the permanent solution and hairsprays linger with me still. One year the store near Sue Johnson’s used to sell these custom made Reinassance type dresses (this was in the early 70’s I think). I remember wearing it years later at a costume party. Trip up the street to Ortman’s Ice Cream store…Wow… thanks for the flashbacks! Wow, I just happened on your blog and love seeing your drawings… they are really wonderful. And, I have tea with my mom every Saturday afternoon at La Farine’s. And of course, I eat at Kirins so these were especially fun and magical to come across I am amazed at how quickly you drew these and still captured so much detail. Thank you for sharing. I especially love that last sketch, Jana – it’s so well designed. I love following along on your sketch crawls!